Neil Cullen swings through the weekend’s main talking points in the world of golf. 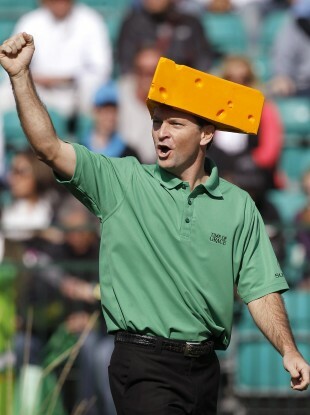 AS IF IT wasn’t a successful enough weekend for the people of Wisconsin with Green Bay’s Packers winning the Superbowl, Mark Wilson won his second PGA Tour event of the season at the Waste Management Open at TPC Scottsdale. Clad in a dark green shirt and yellow visor in support his beloved Packers, he consistently scored well over four rounds, winning in a playoff on Monday evening. After delays early in the tournament because of freezing conditions and bad light, the tournament had to be finished on Monday. Wilson was never far from the lead during the opening three days of play, but took command early on Sunday and held the overnight lead going into Monday with just 6 holes left to play. Fellow American Jason Dufner, however, was determined to make Wilson earn his victory. He shot a flawless five under par 67 in his final round including to set the target at 18 under for the tournament. Wilson could only par his final six holes and had to settle for a playoff with Dufner. It was to be a weekend for the man, and indeed men, from Wisconsin, however, as Wilson birdied the second playoff hole to secure a victory. TPC Scottsdale is now famous for its 16th hole and it was here where the majority of the week’s entertainment was provided. The highlight came courtesy of Jarrod Lyle who had a hole-in-one, much to the delight of both him and the raucous crowd. Back on the European Tour, Thomas Bjorn produced a flawless final round and birdied three of his last four holes to win the Commercialbank Qatar Masters by four strokes on Sunday. In a week that was dominated by high winds in Doha, Bjorn had to overcome a surge from Alvaro Quiros, but held his nerve as the Spaniard made two bogeys over the closing stretch. “I didn’t play particularly well for at least the first six holes. I was really struggling and didn’t hit any fairways, and just kept holing a few putts for pars. I knew it was going to be a tough day, but from there on I started playing a lot better and got more control over the ball and just kept making pars,” Bjorn said. It was thought that the windy conditions would favour the more experienced players in the field and this theory was proved right early on as Retief Goosen lead at the end of day one. A three-over par 75 on day three put the South African’s chances to bed, but 39 year-old Bjorn took over the reins and used his knowledge and patience to bring home the victory. Earlier in the week, much of the talk had surrounded the top two players in the world , Lee Westwood and Martin Kaymer, with the German having the opportunity to take over as World Number One. After Westwood missed the cut, Kaymer had to finish in the top two overtake Westwood at the top, but he was 10 shots behind the leaders going into the final round and finished in a tie for 28th. After Miguel Angel Jimenez’s putter-breaking incident last week, we saw yet another case this week of club abuse. Henrik Stenson put himself in contention on day 2 with four birdies and an eagle in his opening nine holes. Things began to unravel for the Swede, however, as he bogeyed his 15th and 17th holes. Calamity then struck on his final hole of the day, taking nine strokes to complete the par five. The incident of club throwing occurred as Stenson fluffed a pitch shot onto the final green. As the camera followed the ball and moved away from Stenson, it just about caught him letting go of his club after the follow-through. As the camera panned back, we saw a splash in the lake behind Stenson as he walked back to his bag and caddie with no club in hand. It is thought the European are set to fine both Stenson and Jimenez for “conduct unbecoming a professional”. From an Irish perspective, Darren Clarke continued his good start to the season with a 12th place finish and now sits in 28th position in the Race to Dubai money list. Paul McGinley also scraped inside the cut mark to finish in 45th, to a first pay cheque of 2011 of just over €8,000. The 16th at Scottsdale remains one of the greatest holes in golf. Mark Wilson has two wins from three events this year. European players are going through a phase of early season indiscipline with Jimenez and Stenson in the spotlight for bad behaviour. The top three players in the world will appear in Dubai next week as Lee Westwood, Martin Kaymer and Tiger Woods go head to ahead. Imagine that was the final threeball on Sunday! Email “Cheese-head Mark Wilson enjoys Super weekend ”. Feedback on “Cheese-head Mark Wilson enjoys Super weekend ”.